Nya’s people stand on the brink of extinction, out-numbered and out-matched by the technology of their enemy in the North. Her father and her lover are both dead. And not only is it all her mother’s fault, she has lied to Nya all her life. If she wants her revenge, she will have to save the life of a man who died centuries before she was born. She will have to cross the mysterious Ways. Nya and her childhood friend travel half way across the planet to reach the Ways, but several unpleasant surprises are waiting for them beyond those relics of ancient empires. One of which is a band of suspicious northerners who take them captive. Forced to unite with the northerners in her quest against their common enemy, Nya is soon caught up in a dangerous political web fuelled by ambition and jealousy, and she must navigate a precarious path between keeping her secrets and uncovering those of the northerners. As events spiral out of her control, her choices threaten to destroy the people she loves – including the one she comes to love most of all. For there are other forces to contend with. Forces that come from far beyond the Seventh Gate. Inspired by the mysteries, the great love stories, and the tragedies nestled in the prehistoric roots of Arthurian legends and of Celtic myth, Season of the Wild Hunt is the beginning of a tale that follows a relationship through the course of a lifetime, set against the backdrop of worlds at war. Click HERE to download three sample chapters for free – and for all the latest updates and added insider-only bonuses, Subscribe here. The print version is available below, and I’ll let you know as soon as the ebook is launched. You’ll be in line to receive special giveaways, exclusive content, and all sorts of other fun goodies not available anywhere else. The gorgeous, Limited Edition print copy of Season of the Wild Hunt is available now. An ambitious fantasy novel, influenced by Celtic and Arthurian mythology, with a teeming cast of characters and a lively story-world. The Conn/Elen thread wields a jostling cast of characters and hums with intrigue, from its passages on clan politics to its explorations of druidic mysticism. The Nyani/Ashira thread is, by contrast, a stripped-down, tightly-characterised study of two female travellers. This splitting of the narrative gave the novel interesting dimensions. The minimal, action-based Nyani/Ashira thread was refreshing after the mysterious Conn/Elen thread, and vice versa. The diversity of the locations depicted in each thread helped to give the land of Érenn a sense of vastness, as well as depth and detail. The prose is smart, practical yet evocative, equally driving and engaging, and full of quick-witted dialogue and sharply sketched characterisation. The women’s childhood memories and reminiscences were handled well,making them sympathetic and believable. The author displayed a firm understanding of folklore and mythology, tying together strands of the Celtic and Arthurian traditions to create something that seemed at once familiar and new. 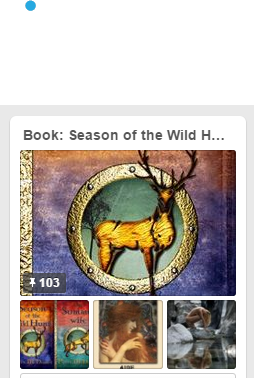 Season of the Wild Hunt was awarded the No .1 position at Harper Collins’ Authonomy in February 2014. “A Butterfly effect that begins at home, ultimately producing the winds of change that shape a world.” William Carson, author of the dark fantasy Few Far Fallen. Subscribe to keep up to date with launch-day events, receive advance notice on special give-aways, and access to exclusive content. It is rare that I read a book and am overwhelmed with tears within the first paragraph but this is what happened exactly when I read the 7th Gate. I knew that I was reading something very special. A book that would go far and wide eventually and touch readers with not only majestic prose but ideas, themes and meta-tropes that exist outside of a fantasty world. A superb novel by a very accomplished and velvet-worded writer. Alright, I’m gonna wax poetic for a moment in my comment: Beautifully written and well-deserving of it’s #1 spot, The Seventh Gate is equally riveting be you a romantic, adventure-junkie, or history buff enamoured with Celtic legends. It seamlessly weaves drama and legend and it’s appeal unquestionably wide. You’re artwork on the blog (and the book cover) is frigging gorgeous. The only critical thing I have to say about your book blurb is the first two sentences– they’re kind of redundant together. I’d take out the first one (“at it’s heart is a love story”) and in the second one I’d switch the references to Celtic myth and Arthurian legends since Arthur is more widely recognizable I’d lead with that. I’d lead with something like ” Inspired by the great love stories nestled in the prehistoric roots of Arthurian legends and of Celtic myth, The Seventh Gate [italics] follows a relationship through the course of a lifetime, set against the backdrop of a world at war.” But that’s just me. What’s working for me in this book? Everything is. Every author has his/her own style. One prefers starting with brisk action, the other reveals the plot of his/her story beginning from the basics. So many writers – so many styles. The same is with readers’ tastes and preferences. The preferences of reading public changes, no doubt, in the course of epochs, nevertheless it would be a mistake, as to me, to go as far as to run the plot full speed from the very first sentence in order just not to loose the reader’s interest. It’s true, many readers nowadays possess perfectly adjusted to Twitter posts a goldfish memory and ability to concentrate of a six-year-old kid. However, I have grave doubts whether we should adopt to the tastes of this public.The author of Sevventh Gate has began her story in a way it can’t but hooks the reader’s attention. The pictures and images she draws to us are bright and live. A balmy midsummer night, a girl in a boat wrapped in a mantel, Conn, Ellen, a priestess-mind-reader, an offended honour desperately seeking for vengeance, and all these spiced with love and expectations of adventures. Who can stand it? The other parts purely meet the reader’s expectations. Nyani’s and Ashira’s quest through dangers of unfriendly lands to An Tor Mor is full of skillfully woven into the fabric of the story retrospectives, adventures, and… mystery ahead.